For those interested (in particular schools, civil associations, etc. ), the Communication and Education Section organizes guided tours of the buildings of the Chamber of Deputies. The excursion starts with the screening of a short film on the activities of the Chamber of Deputies in the Information Centre, situated at the Lesser Town Square (Malostránské náměstí). It is followed by a guided tour of major areas, including a visit to the foyer, the visitors' gallery in the Assembly Hall and adjacent areas. If permitted by the meeting timetable, it is also possible to visit one of the meeting rooms. The Chamber of Deputies is an institution throbbing with life and the tour therefore has to be adapted to its operation. For the same reason, it is not possible to carry out excursions during plenary sessions. 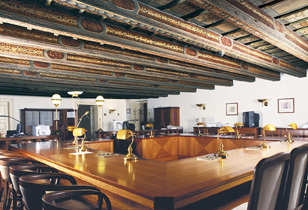 However, it is possible to visit the visitors' gallery during the meetings of the Chamber of Deputies. The tour is free and is accompanied with expert commentary, focusing on the functions and activities of the Chamber of Deputies, the Czech parliamentary history and the architecture and history of the buildings. The total duration is approximately 75 minutes. Tours are organized always on weekdays, between 9:00 and 14:30 o'clock. The maximum number of persons per tour, including guides, is 30. Larger groups have to be divided for safety reasons and to ensure the quality of the guide commentary. The interest in tours among the public is large, there are over 1,500 people participating each month. We therefore recommend to book excursions at least two months in advance. Tours have to be booked in advance in the Information Centre, at phone number 257 174 117. The booking is subsequently confirmed by email containing the formal request. The completed request shall be sent back electronically, by fax or by post. If the request is not approved or if another reason occurs due to which the tour cannot go through (extraordinary meeting of the Chamber of Deputies etc. ), you will be informed in time. We look forward to seeing you in the Chamber of Deputies! Poslanecká sněmovna sídlí ve Sněmovní ulici, na Malé Straně.